Greg Hinz at Crain's Chicago Business congratulates Chicago for its nation-leading population growth. Heinz also notes that the far suburbs also gained population strongly, but there had been losses in the areas between the two. He asks: "the question now is whether the area can prosper with a thriving core but sinking neighborhoods and inner-ring suburbs around it." The area within 2 miles of downtown gained nearly 50,000 people between 2000 and 2010. No other US metropolitan area equaled this urban core population increase. The article cites a number of factors beyond population growth to indicate that the city of Chicago is outperforming the suburbs. Retail sales tax collections have increased faster in the city. However, Hinz also notes that there has also been a sizable proliferation of big-box stores (Target and Wal-Mart), which is made it possible for residents to shop in the city instead of the suburbs. Hinz notes that "empty nesters" are moving to the urban core. Yet this is not confirmed by the data. Between 2000 and 2010, the age cohort that was from 55 to 64 years old in 2000 dropped by 55 percent as a share of the population in the fast growing core census tracts of central Chicago. In contrast, in the city of Chicago overall, the loss was 25%, and the reduction was 24% in the entire metropolitan area (Figure 1). Our previous national research showed that the population losses in this cohort were the greatest in the core cities among the 51 major metropolitan areas. The article goes on to quote Alan Ehrenhalt to the effect that an "inversion" of the city to suburban movement pattern is occurring, and "it's happening more in metropolitan Chicago than just about any other city in the country." "Inversion" implies "turning upside down." For an inversion to have occurred, there would need to have been a reversal of the trend in movement from the core cities to the suburbs. The most important indicator of any such inversion would be that domestic migration would show a flow from a suburbs to cities. It does not. 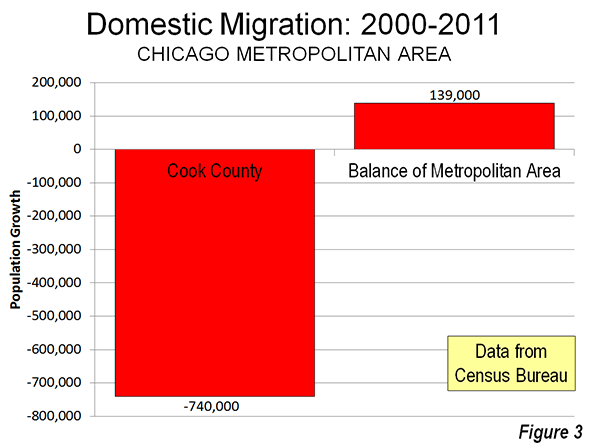 Domestic migration from Cook County, in which Chicago is located, was minus 740,000 between 2000 and 2011 (Note). Domestic migration in the suburban counties was a plus 139,000. Thus, there was no net migration from the suburbs to Cook County (Figure 2). The story was much different outside the core area. The balance of the city, where 93 percent of the people live, lost 250,000 residents – a loss greater than that of any municipality in the nation over the period – including Detroit. The losses were pervasive. More than 80 percent of the city's 77 community areas located outside the core lost population. Thus, the core area boom is far more than negated by the losses in the balance of the city. The losses that were sustained in the area between the urban core and the outer suburbs and exurbs were virtually all in the city itself. At the same time, the inner ring suburbs (between the city and 20 miles from the core for this analysis) grew only modestly, gaining less than 20,000 between 2000 and 2010. This is not unexpected, especially in a metropolitan area with slow growth, like Chicago. Urban areas tend to grow organically, with the greatest growth on the urban fringe. As the urban fringe moves further from the core, growth will be less in the established developed areas. An important exception is the small pockets of growth developing and occupying previously disused warehouse and commercial and even railroad yard areas. The core of Chicago is among these, along with Portland's Pearl District, the Washington Avenue corridor in St. Louis, the Third Ward in Milwaukee, and others. The exit of commercial activities permitted conversion to residential uses, often decades after the abandonment of previous uses. The overwhelming reality of metropolitan growth in Chicago, however, is that the outer suburbs and exurbs continue to capture virtually all growth. 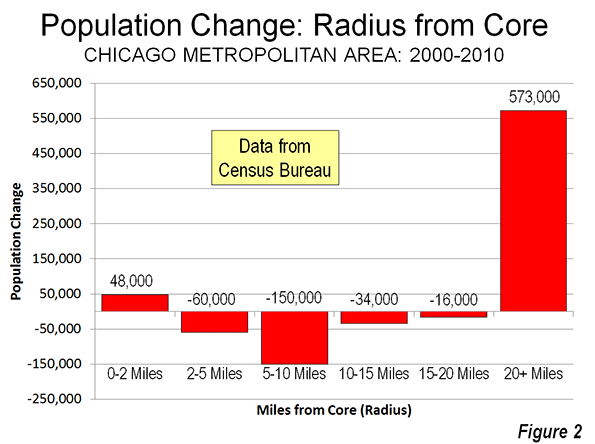 Overall, areas outside 20 miles from the core of Chicago gained 573,000 residents between 2000 and 2010. By contrast, the entire metropolitan area gained only 362,000 residents. 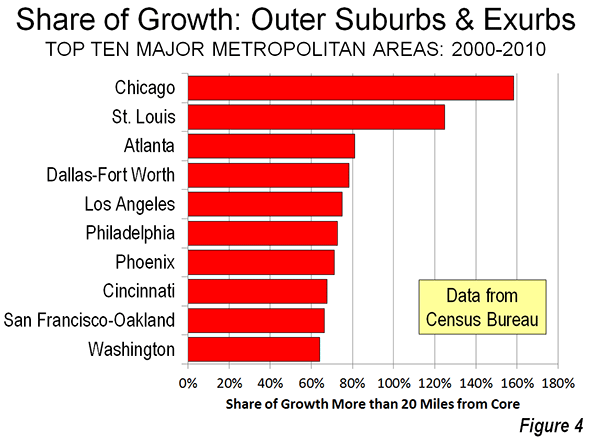 As a result, these outer suburbs and exurbs accounted for 158% of the Chicago metropolitan area's population growth between 2000 and 2010. The core gains, city and inner suburban losses are illustrated in Figure 3. Approximately 52 percent of the metropolitan area population is now in the outer suburbs and exurbs. If Chicago's outer suburbs and exurbs were a separate metropolitan area, they would rank as the 10th largest in the nation, with a population of nearly 5 million, between Atlanta and Boston. As significant as Chicago's core population growth has been over the last decade, it has been substantially overshadowed by outer suburban and exurban growth. Approximately 12 residents were added in the outer suburbs and exurbs for each new resident in the urban core. Like its urban core growth, Chicago's growth in the urban core led the nation. Only one other metropolitan area, St. Louis, exceeded 100 percent in its population growth outside a 20 mile radius from downtown (Figure 4). Note: Domestic migration data is not available below the county level. Submitted by rich_b on Tue, 03/19/2013 - 16:17. 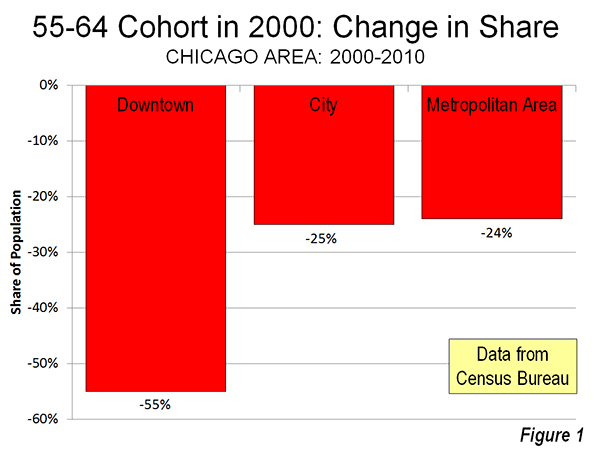 Before the 2010 census came out, I was predicting population loss for the city of Chicago. Most mocked and told me I was dead wrong on the subject. Most were predicting a population gain! But the loss of 250,000 residents from the city even shocked me (I was thinking more in the line of 150,000). I know its a horrible time to be middle class or a family with kids in the city, with its lousy schools, high taxes and poor & corrupt city services (most of my city friends complain all the time about how the city is unable to pick up trash and plow streets correctly). However more and more people are voting with their feet and they are leaving the city (and in a lot of cases, Illinois altogether). Until the city (not just Chicago, but just about every large city)starts taking middle class needs and wants seriously they will lose those people. The cities don't do anything worthwhile now. The "creative" class, the rich and the very poor will make for a very unlivable place for all. There will never be enough rich and creative" to have more then little pockets in a very dangerous and poor city. There are far too many unlivable places on the south and west (and even north) sides of Chicago. Meanwhile 90+% of the growth will continue to be in newer suburbs.